Kristi Gibson has been passionate about the travel industry for years. She loves Disney, Universal Studios, and cruising. Kristi is married to her high school sweet heart and has her own little prince and princess. As a mom that travels with her own children regularly, Kristi understands the joys and the challenges that can come up when traveling with children at various ages and stages. She is a great resource to advise you as you prepare your family to take on a vacation adventure! Kristi loves to make memories on vacations with her family and wants to help you create memories of your own! 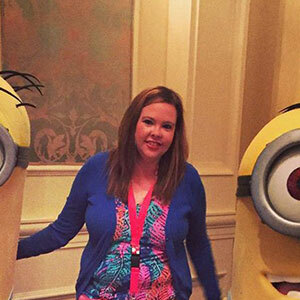 Kristi is a graduate of the Disney College of Knowledge and has participated in onsite trainings at both the Walt Disney World Resort and Universal Studios Orlando Resort. She has completed training for other family destinations such as Sea World and Royal Caribbean Cruise Line. When Kristi is not booking travel, she is at the beach, shopping, and watching her daughter dance at her local dance studio. She also loves photography and believes photos can capture great memories to relive once you are back home. Disney Destinations including the Walt Disney World Resort, the Disneyland Resort, Disney Cruise Line, Adventures by Disney, and Aulani, a Disney Resort & Spa.